The blogosphere this week is all abuzz about the supposedly desire-inducing Upravlator. The awkwardly-named hardware comes from Art Lebedev, the mysterious designer who first promised the Optimus Keyboard, a unique “design concept” with tiny color displays under each key. 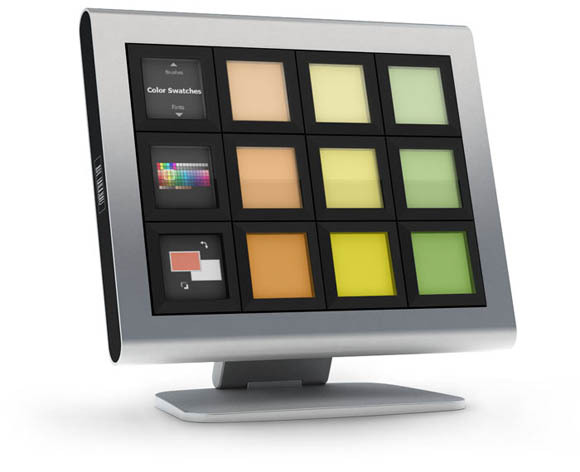 That indeed sounds cool, but instead, after months of delays and promises, the shipping product turned out to be the Optimus Three, with three little displays that double as buttons. Full keyboard with displays: interesting. Three display buttons with no real function: erm? Instead of spending about US$150 on an Optimus Three, why not a Nintendo DS Lite? Which do you think would be more useful? Worst of all, the Upravlator takes up lots of desk real estate and a free VGA port — two things better dedicated to a real monitor, especially when touchscreen monitors are coming down in price. The dynamic keyboard remains a cool product. It may come in at an astronomical price, but the concept is good: take the physical feedback and ease of a great hardware input device (keyboard) and add dynamic visuals to make it more flexible. By contrast, the Upravlator and the Optimum Mini Three are useful neither as displays nor as input devices and actually reduce efficiency. We’ll wait for the Optimus-113 keyboard, if it can actually ship. 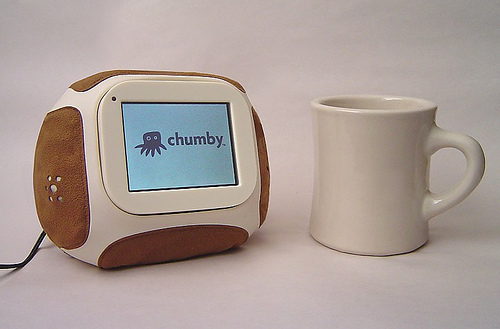 The Chumby is something I could actually imagine putting to use, in performances, in installations, by my computer, by my bed. It’s a more elegant design, and it can be customized to be whatever you like. It does things your computer and peripherals can’t (be easily moved, easily programmed, all while remaining independently connected to Wi-Fi, etc.). And the target price is intended at US$150. Now if we could just buy the thing … stay tuned. And yes, we want one — for adding Flash animations, for designing custom interfaces, for hacking, for hugging.